The problem is under control now. No one would think of getting an abortion. There’s already talk about cutting back the program in a few years and I feel kind of sentimental about it. I’ve grown up with executions and can’t imagine what kids will watch instead. Not that I would wish this on anyone. It’s a miserable thing to be in my situation. 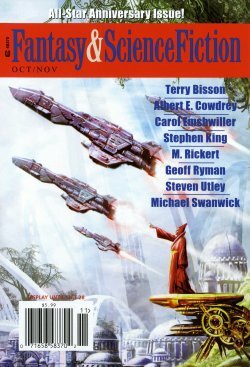 So speaks Lisle, the young narrator of M. Rickert’s most recent story, “Evidence of Love in a Case of Abandonment: One Daughter’s Personal Account“, published in this year’s October/November double issue of F&SF. The sentences above are fairly typical of Lisle’s style and tone; what’s significant about them, I think, is where they place their emotional weight, and which emotions they invoke. By this point in the story, for example, we know that “the program” is the systematic capture and public execution of any American woman who has ever had an abortion, but it’s still a shock to realise that Lisle is so used to it as a background fact of her life that she would miss it if it were gone, and still hard to imagine anything so brutal as entertainment for children. We also know that, as the daughter of a “disappeared” mother, Lisle is something of a social pariah. Having an executed mother is “not necessarily that bad”, purely because it’s so common; “a lot of women of my mother’s generation,” Lisle explains, “were swayed by the evil propaganda of their youth, had abortions and careers even, before coming back to the light of righteous behaviour.” A missing mother, on the other hand, is cause for suspicion: where has she gone, and what is she doing? So Lisle resents her mother’s perceived selfishness in leaving, which explains the miserableness, even if it’s difficult for us to accept. With the example of the Taliban before us, no one can really say anymore: This couldn’t happen. Yet it is up to the author to convince us that it could have actually happened, or at least to willingly suspend disbelief and enter into the mutual pact between author and reader in which we accept the scenario for the sake of the message the story is meant to deliver. The problem with such fiction, however, is that the Message can outweigh the story, and I think that in this case it has done so, going too close to the line between chilling and absurd. While I can take issue with various bits of this assessment, I do think the question of plausibility is hard to avoid when talking about “Evidence of Love”. The idea of an authoritarian, theocratic government presiding over the continental United States is, at this point, something close to a cliché, but even so – and despite the fact that the magazine blurb introduces Rickert’s story as “a chilling glimpse of how the near future might be” – this version of this future is not one I can believe in, Taliban or no. It goes too far, too fast. I can believe (with depressing ease, in fact) in the advent of an American government that criminalizes abortion, even to the point of enforcing the ban with the death penalty. And I recognise that there are people who would like to go as far as the story does, and kill everyone who’s ever had an abortion; one of them provides the story’s epigraph, taken from a 1995 speech: “When I, or people like me, are running the country, you’d better flee, because we will find you, we will try you, and we’ll execute you.” You don’t need to know who Randall Terry is (I’d never heard of him) to understand that “Evidence of Love” is a story where he, or someone like him, has made good on his promise. My difficulty is in believing that a regime capable of enforcing a retrospective ban could arise in the United States within (as “Evidence of Love” must be) a generation. The distance between Randall Terry’s current residence and the White House seems too great to cover in that time, never mind that – so far as I’m aware – there has never been a retrospective act of criminalization on such a scale, and with such severe consequences for those convicted. So I can’t see “Evidence of Love” as a story about “how the near future might be” in anything more than a technical sense and – to return to Tilton’s criticism – I don’t think any writer could have rendered the story’s world convincingly enough to withstand post-reading reflection. I wouldn’t normally spend this much time discussing whether or not I found a story’s premises plausible, because for an awful lot of science fiction the question is something of a blind alley: execution is all. (And in twenty-five years, when “Evidence of Love” is just one more of yesterday’s tomorrows, the question will be all but irrelevant.) I’ve spent some time on the issue here because, as I indicated, I think you can’t not. “Evidence of Love” gives every impression of being an Awful Warning, which is probably one of the exception categories where plausibility is concerned. If it’s not likely, after all, how urgently can we need to be warned against it? But in both “Evidence of Love” and Rickert’s only other straight sf story (so far as I’m aware), “Bread and Bombs“, the future is presented to us as a fait accompli. Both stories, in fact, draw their power from a gradual accretion of detail, not about the world, but about its inhabitants. there’s also the fact that the narrator is so clearly brainwashed. She’s someone we can pity, but not sympathize with, because her reactions are so obviously wrong and twisted. Rather than putting us in her head and inviting us to feel her pain (and there is real pain there – this is a child who has lost her mother and been raised to believe that that mother is a horrible person), the narrative stands apart from her and regards her – or rather, what’s been done to her – with disgust. I read the story differently. I don’t think, for example, that it’s accurate to describe Lisle as brainwashed, since she had no original convictions to destroy and replace. Rather, her personality and beliefs are the result of simply growing up in this future. As indicated in the quotes above, Lisle’s worldview has been shaped by the regime under which she has been raised: she talks of “righteous behaviour” entirely without irony, and resentfully assumes, as the title suggests, that she has been abandoned — the possibility that her mother has been taken never seriously crosses her mind. My cheeks turned bright red, of course. I was embarrassed for her to talk like that. She tried to make light of it by looking over the list, letting me know which names she liked (Liam and Jack) and which she didn’t (Paul and Luke). If the time ever comes (and I am beginning to have my doubts that it will) I’m going to choose one of the names she hated. It’s not much, but it’s all I have. There’s only so much you can do to a mother who is missing. This, to me, is heartbreaking. Nothing in the passage stretches beyond what it is conceivable for Lisle to have noticed or for her to be describing, yet it evokes so much in subtle ways: the long run-on sentence indicating how much the memory troubles her, the mother’s simple statement indicating how bad things have got, the choice of names extremely suggestive of the type of people who are responsible. There is, I think, just a hint in her final sentence that her feelings about her mother’s absence may come from more than one source; a suggestion that, however much she professes to be angry, knows she should be angry, Lisle misses her mother. But that’s powerful precisely because Lisle herself is unaware of it, and for Rickert to make more of it would be to betray her character’s integrity. So I don’t know that I can agree with the idea that we should be able to sympathize with Lisle. It seems to me that the distance we are kept from Lisle is the major source of the story’s strength, since it enables the emotional misplacement I talked about at the start of this post, and the feeling of hopeless dislocation it engenders in the reader (or, at least, me). When it is strongly implied that, as the daughter of a disappeared mother, the best Lisle can expect later in life is to be a “breeder”, we should indeed pity her; but we should also notice that the problem with being a breeder (for Lisle) is not the idea of being forced to have children per se (since what could be more natural?) but the idea of having to give those children up to other people, every time; the idea of never being allowed to be a mother. Occasionally there is a stoic one, but there aren’t many of these, and when there is, it’s easy enough to look away from the screen and focus on the big picture. What had she been thinking? How could she murder someone so tiny, so innocent, and not know she’d have to pay? When I think of what the time from before was like I shudder and thank God for being born in the Holy Times. In spite of my mother, I am blessed. I know this, even though I sometimes forget. Right there, in the football field bleachers, I fold my hands and bow my head. When I am finished my father is giving me a strange look. “If this is too upsetting we can leave,” he says. He constantly makes mistakes like this. Sometimes I just ignore him, but this time I try to explain. “I just realized how lucky I am.” I can’t think of what else to say, how to make him understand, so I simply smile. We stand with her father here: we expect Lisle to be upset by what she’s watching, but of course, believing as she does in the rightness of what is occurring, she finds it reassuring, draws strength from the ways in which (she thinks) it keeps her safe. It’s all the more disturbing because her thoughts are clearly those of youth, and unconsidered. After the shot, this is her reaction: “I see the gaping maw that was her head, right where that evil thought was first conceived to destroy the innocent life that grew inside her. Now she is neither stoic nor alive. She lies in a heap, twitching for a while, but those are just nerves.” It is, to Lisle, justice. To me, what ultimately makes “Evidence of Love” a success is that we never doubt Lisle. She makes the world real, which is to say that the tale gains what power it has not from the abhorrence of the society in which it is set, but from the shock of what that society has done to Lisle; and the trick at the tale’s heart is that if the society in which it is set were more plausible, Lisle would be less shocking. Put another way, if “Evidence of Love” were merely an Awful Warning against the rhetoric of anti-choice positions, if it were merely a Message story, it would be somewhat facile. The awfulness is fairly obvious. We would indeed, as Abigail puts it, be being invited to sneer. But I don’t think the same follows from the fact that we’re held apart from Lisle. We may not be able to fully sympathise with her, but I think we can certainly understand her, and most particularly we can understand that she doesn’t understand herself. After all, the only certain evidence of love that Lisle displays comes in the very last line of the story, and is its final sting: it reframes everything that came before as a denial. Haven’t read the story, but yeah, being punished for a crime that wasn’t a crime when you committed it (an ex post facto) law, is prohibited by the Constitution. Although, if you’re positing a country where it’s okay to kill tens of millions of women, I guess the constitution doesn’t really matter as much. But, there’d also just be a massive logistical problem. How are you going to get the names of every woman who’s had an abortion? It’s not like there’s some massive database out there listing them. Even if the law was amended to allow doctors to rat out their patients, most doctor’s just don’t keep records that long. Quibble: surely it is possible to say that a person has been brainwashed if they’ve been raised in a restrictive, dogmatic culture which promotes conformity with its values and opinions by, for example, encouraging attendance at public executions? Which, by the way, is why I still think you’re dead wrong about the similarities to “The Lottery,” as both stories are driven by this overwhelming push to conform, which overrides individual morality. I think if “The Lottery” were told from the point of view of one of the villagers the result would be similar to “Evidence of Love,” though probably not as good. I agree that Lisle is well-done – in fact I was probably too dismissive of her when I ascribed the story’s emotional impact wholly to its premise – but I’m not sure how that makes “Evidence of Love” not a manipulative story. You may be right that Rickert is aiming less for an Awful Warning and more for a look at a person twisted by their society’s morals, but I don’t think it follows that “Evidence of Love” is merely a character piece. Rickert chose to ground the the story in a real-world issue, and to draw attention to real-world attitudes that correspond to the ones expressed in the story. She’s borrowing significance from a political issue and from her readers’ no-doubt strongly held opinions about it. “Look how twisted a woman can become when she’s raised in a violently anti-abortion society” is not as facile a point as “if this goes on, women who have had abortions will be rounded up and shot,” but I still maintain that it is inviting readers to look down on the story’s characters. Abigail’s description of how this story is similar to “The Lottery” is how I saw that connection, too. I read it very much as from the point of view of someone in a group dynamic like that described in the Jackson story. An insiders point of view, so to speak. I think one element that is not being examined in this story, and perhaps why Abigail finds the story manipulative and invites the reader to look down upon the characters, is perhaps a contextual element. I think M. Rickert is often a “horror writer” and in that sense, she is writing in an interstitial space between the motives of political science fiction and horror. I feel not a sense of looking down on these characters so much as fear, dread, terror. I think it’s a posited future/horror story grown from the seeds of the anti-choice groups in American culture that has gained much political power in the past decade here. Rakhan: yes, exactly. If you have to get round the constitution to do it (and I gather we have similar protections against such laws in the UK), I think it’s going to take longer than Rickert allows. Abigail: I’m still reluctant to use “brainwashing”. To me that does convey images of people having beliefs drilled into them, probably with torture of some kind to break down their existing beliefs. And I think it’s an important point of the story that that’s not what’s happening; rather, it seems to be the case that anti-choice beliefs have been made axiomatic, they’re just in the air that Lisle believes growing up. And I’m afraid I still don’t really see how we’re invited to look down on the story’s characters. On the people in power who have caused this to happen, and by extension their real-world counterparts, perhaps — but within the story the people in power are never mentioned. We’re not encouraged to think about them. I think our sticking point may be “manipulative”. It seems to me that all fiction is manipulative; and indeed that one of the points of criticism is to look back at something and figure out how it manipulated you. So saying that “Evidence of Love” is a manipulative story doesn’t feel like much of a criticism to me; you could rephrase my point as being that Lisle’s narration was so convincing that I didn’t notice I was being manipulated while I was reading, which I take as a good sign. On “The Lottery”: well, maybe my view is coloured by not finding Jackson’s story terribly compelling, but to me the change from looking at a group dynamic to looking at an individual is significant enough that it makes the comparison of limited use. Chris: Yes, you can frame the story as horror; to extend one of the points I made in the post, you can say that Rickert is a writer interested in subjective experiences that will be alien to most people. That’s less interesting to me than looking at Lisle, though, because I have to find something plausible to find it truly scary, and while I find Lisle within the given context plausible, I don’t find the context itself plausible.